The Society for Research into Higher Education (SRHE) held its annual conference in New Port South Wales from the 6th to the 8th December 2017. 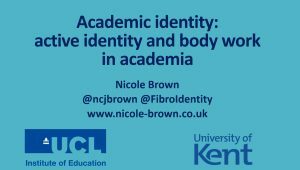 In my presentation I talked about academic identity, the construction of academic identity under the influence of fibromyalgia and the active body work and identity work academics undertake to maintain their academic identity. With Higher Education undergoing increasing changes academic life is more pressurised, less autonomous and less secure. Against this backdrop mental health issues and illness within Higher Education are on the increase. In this paper, I present an exploration of academic identity under the influence of fibromyalgia. Fibromyalgia is a complex, gendered, contested syndrome characterised by widespread pain, chronic fatigue, sleep problems, psychological disorders and cognitive dysfunctions. Through an embodied, phenomenological approach with metaphors and representations I seek to understand the life of academics with fibromyalgia. Data drawn from timelines, interviews and identity boxes describes the life for academics with an illness on the cusp of the physiological, psychological and somatic. The analysis provides an insight into the conscious identity work and body work required to reconcile the experience of illness with the academic’s public face and life. I conclude with a discussion of participatory and inclusive research within Higher Education.